Have you heard of the songs “Edelweiss”, “Do-Re-Mi”, and “My Favourite Things”? Do you know what movie it comes from? @blukrisna: I love that film! best musical I’ve ever seen! “The Sound of Music”, a movie released in 1965, tells the story of Maria and the Von Trapp Family. The movie was based on a Broadway theatre play based on the book The Story of the Trapp Family Singers by Maria von Trapp. The Broadway play’s plot was not as true to the story but it is based on the real family’s existence. The plot tells the journey of a young postulant at Nonnberg Abbey, Salzburg, Austria, named Maria. The nuns and Mother Abbess have found her troublesome. When there was a request from a widowed Austrian naval captain looking for a governess for his seven children, Mother Abbess asks Maria to accept it even though Maria was reluctant. Captain Georg von Trapp, the widowed Austrian naval captain, seems so strict to his children. Maria then breaks the ice to the kids by teaching them singing and allows them to play, even planned a trip around Salzburg for them when their father’s away with a lady that he likes at the time. The children’s singing impressed a friend of the Captain and wanting to enter them to the Salzburg Festival. In the story the captain disapproves, but the story goes on with music surrounding them. The singing activities made us the audience felt engaged, wanting to sing-a-long, as the songs were not hard to sing. Since then Sound of Music songs were known to the world up until today, to some are songs to be learnt as beginners in music. 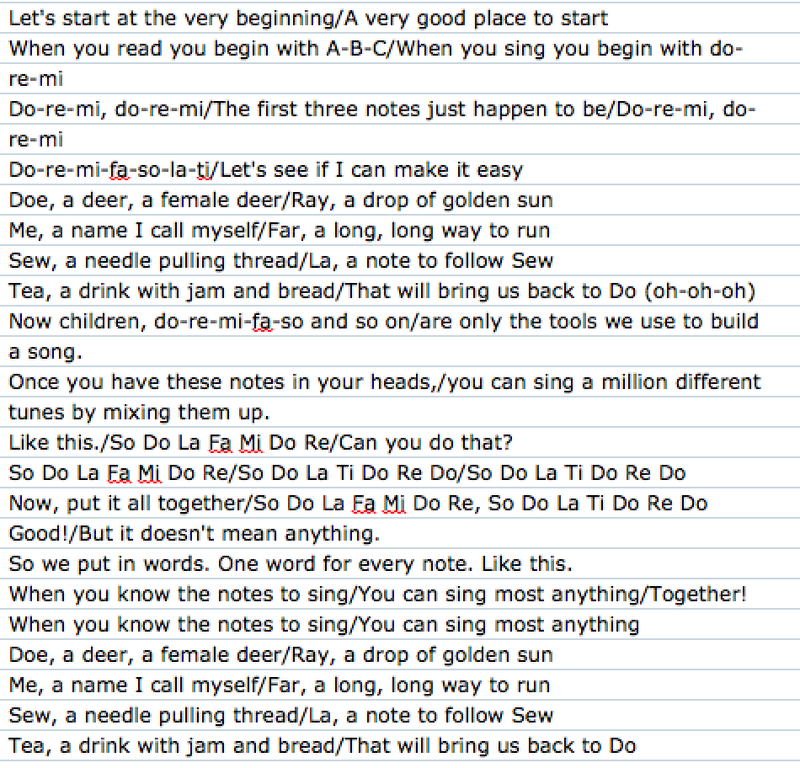 Some of the songs could even be our way of learning English such as “Do-Re-Mi” and “My Favourite Things”. They have quite catchy melodies and easy lyrics, which is a perfect way to learn something new.